Main Track Cafe offers a wide range of home cooked food for breakfast, lunch, and dinner. Try one of our hearty sandwiches that come with pickles and French fries, or go for an entrée such as our deep fried jumbo shrimp or chicken fingers. 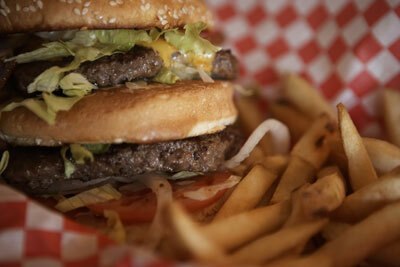 We also have several burgers available, along with pasta, light plates, and several freshly baked desserts. Breakfast includes pancakes, French toast, egg plates, omelettes, and more. Check out our full menu below. Served with pickles and French fries. Substitute French fries for salad for $1.00. Add $1.50 for soup of the day. All entrees come with fries, (baked, oven roast or mashed) vegetables, garlic toast and your choice of tomato juice, soup of the day or tossed salad and dessert of the day.